Hi Everyone!! Welcome to the First ever Elizabeth Craft Designs Design Team Challenge. Once a month we (the designers) will have a challenge using a different theme here at the ECD blog and this month's theme is Flowers. What a better way to hurry Spring in and Winter out than the use of flowers. I don't know about you but I'm tired of winter, here in Alberta, the winters can be long and cold almost 6 months long. So I can hardly wait for Spring, I have already heard the geese back in town. So for my inspiration since I'm a Horticulturist, I decided to have a flower shop as the basis for my card challenge. For the front of my card I used Blushing Bride for my base which is a 5"x 7" finished card size. I then used Bo Bunny 'Primrose' collection for the rest. 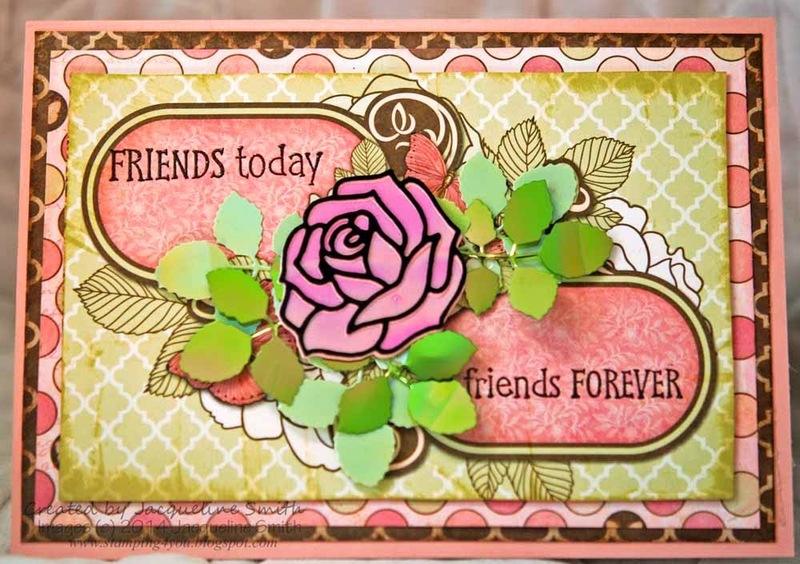 I added 3 layers and then cut the rose silhouette using the Elizabeth Craft Design die called "Roses (799)" using the iridescent pink shimmer sheetz. I then used the black velvet paper and cut it out using the same die but used the overlay instead. I then cut out various leaves from the same die and used Green Iridescent and Green Peridot Gemstone Shimmer Sheetz. I stamped the sentiment using black crafter's ink, clear embossing powder and used the stamp called 'Friends Forever'. A neat trick is to lay clear magic tape over the words you don't want inked, remove tape and stamp. Then do it for the other side and that's how I stamped the words in 2 different spots. 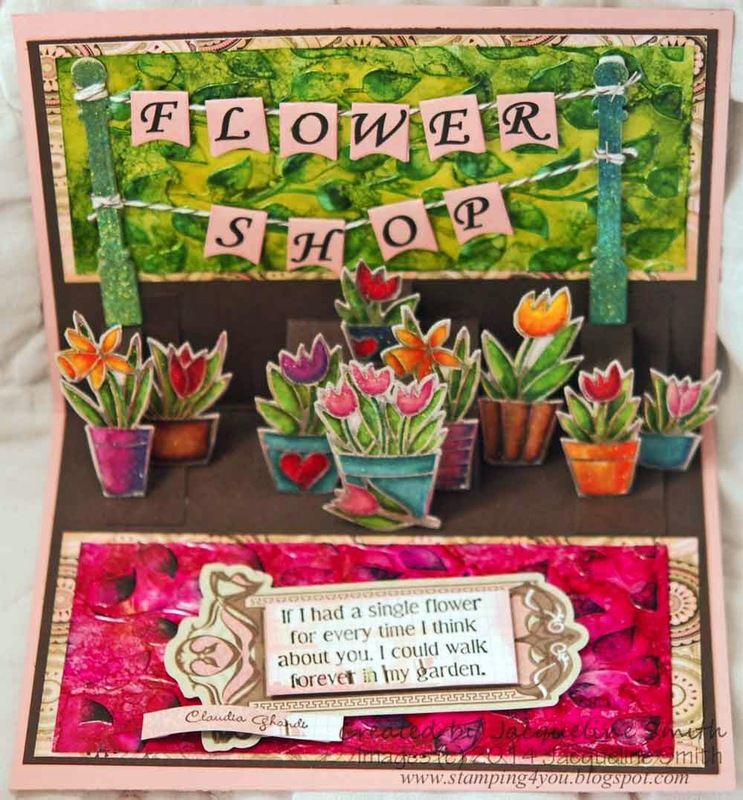 For the inside, I started off using Early Espresso paper for my base which is 4 3/4" X 6 3/4" which will fit inside the pink card base and cut it out using Karen Burniston's Lots of Pops die which cuts out the various platforms to which you can add flowers as seen here. In Karen's March Challenge for her design team she shows you how to add more platforms as seen in this video here. So I have added 2 more platforms to add more flowers cause you can never have too much flowers in a flower shop. I added another layer of paper from the Primrose collection and then cut out another Green Iridescent Shimmer Sheetz and emboss using Curvy Leaves Embossing Folder by ECD. I then used some Alcohol ink in various green colors to add some depth. I then cut out the posts using the same die, it was part of the die package using double sided adhesive backed onto brown paper. I then used Teal (628) & Leaf Green (634) Silk Microfine Glitter by ECD to color the posts. I then printed out the 'Flower Shop' words onto Blushing Bride paper and cut it out using banner die that came with the Lots of Pops die collection. I strung the words on using Early Espresso twine and used Tim Holtz little stapler to attach them. I then used the Peel Offs by Elizabeth Crafts called 'Flowers in Pot" (SKU 0356). One of my favorite ways to color Peel Offs is to used double sided adhesive, Cool Diamond glitter and Copic Markers. Els van de Burgt has a really great video to show you how it is done as seen here. For the bottom of the card, I added another layer of paper and then cut a piece of pink Iridescent Shimmer Sheetz. Again ran it thru Curvy Leaves Embossing Folder by ECD and then used some Alcohol ink in various pink and red colors to add some depth. I added a sticker from the Primrose Collection by Bo Bunny and stamped the sentiment by Penny Black "The Thought of You" using black crafter's ink and clear embossing powder. I cut it down so it would fit on the sticker. Check back on March 31st for the rest of the Design Team cards on the Elizabeth Craft Designs blog. Wow Jackie - this is amazing. 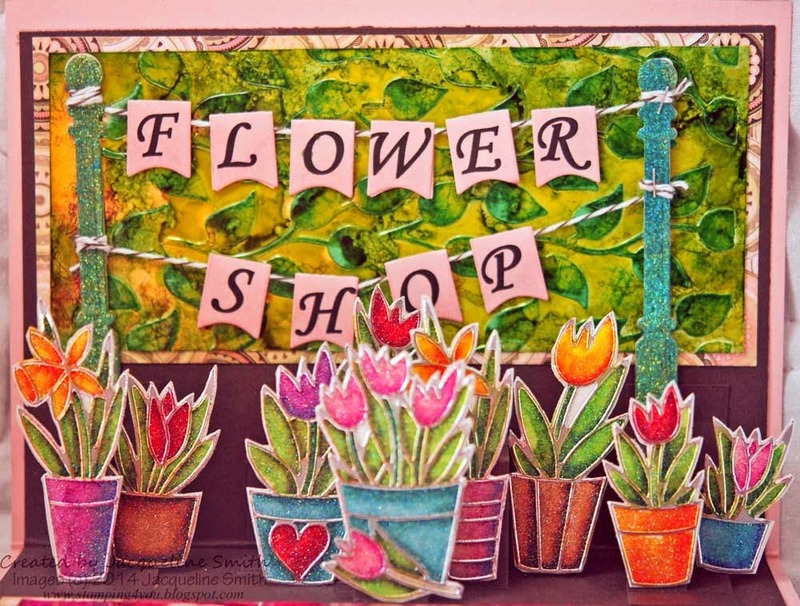 I can only imagine how sparkly this card is in person - LOVE your wonderful flower shoppe! Oh how I love sparkle, and I'll bet this card has lots of it. Such a pretty flower shop you've created. Really pretty card - makes me want to shop there :-) Love the colors! Really looking forward to share this card on our blog tomorrow! A beautiful bunch of flowers! Fluttering Bye To Say 'Happy Birthday'! !